Our 30cm box fan is a great way to beat the heat during the warmer weather. Featuring 3 speed adjust..
Keep cool in summer with the Maxim 30cm Box Fan.Features30cm Box cooling fan.Rotating gr.. Remote Control Pedestal Fan from MaximThe Maxim 30cm Remote Controlled Pedestal fan will conveni..
3 speed settings.Adjustable tilt fan head.Safety guard.Fixed or oscillating operation. 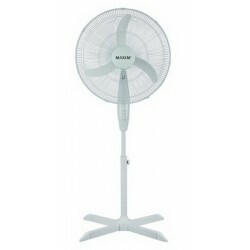 ..
Stay Cool with this Extra Large Pedestal FanNot your ordinary pedestal fan, the Maxim 50cm Pedes..